Sleep apnea (repeated interruptions to breathing while you sleep) starves the body of oxygen. A grave threat is made to the body when there is no air to every cell in the body five to 100 times an hour, for 20 to 30 seconds an episode. According to the National Institute of Health up to 18 million Americans are affected by sleep apnea. If untreated, sleep apnea can result in numerous health problems such as high blood pressure, stroke, heart failure, diabetes, depression, and headaches. CPAP (continuous positive airway pressure) has long been the accepted treatment for obstructive sleep apnea. But, it has been *estimated that 60% and some estimate up to 83% of patients cannot tolerate the use of the CPAP mask and oxygen tank system. With the rejection of the CPAP, the American Academy of Sleep Medicine designated dental sleep oral appliances as the No. 1 non-surgical alternative for those who are CPAP intolerant. 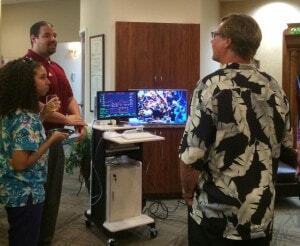 Dr. Merrill recently finished a continuing education course on using a very special system that uses a pharyngometer. The pharyngometer uses sonar waves that measure the size of the oropharyngeal airway. The airway is measured with the sleep appliance in place and without, thus allowing Dr. Merril to customize the appliance to the correct size to comfortably and effectively open the airway. We would love to help you find a comfortable and effective way to deal with your sleep apnea in Huntersville expert Dr. Merrill’s care. Contact us or call our office at (704) 450-6500 for a consultation with Dr. Merrill. *Redline S, Adams N, Straus ME, et al. Improvement of mild sleep-disoriented with CPAP compared with conservative therapy. Am Journal Respiratory Critical Care Med. 1998; 157:858-865.